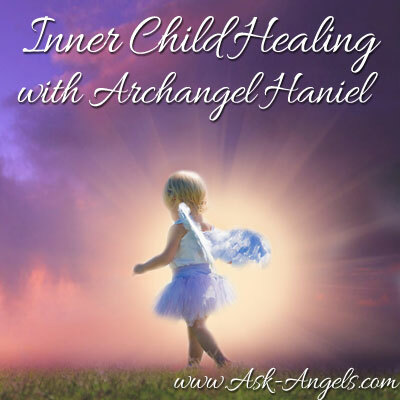 Archangel Haniel connects in this new guided meditation to bring healing and rejuvenation to your inner child. This inner child healing meditation will of course positively impact you in this present time and space as well! Breathe and listen, to release the wounds of the past into the light, and to integrate the full Divine qualities of your Higher Self and Divine inner child now. Refresh, revitalize, and reawaken the Divine imagination of your inner child, and the sense of well being and knowing that you are provided for and that all is well. Integrate qualities of playfulness, self-f love and nurturing with Divine healing and frequency for your heart and soul. This meditation will help you to feel and know that you are loved and safe. You will align with well-being, divine imagination, excitement, and radiant well-being. Download the true essence of your Divine inner child into your present being now to heal, uplift and inspire you to move forward in the direction of your dreams. Listen to this Angel Message as an .MP3, or view on YouTube below! Or scroll down to read the transcription of this message with Archangel Haniel. Greetings dear one. Indeed, I am Archangel Haniel and I am pleased to make this connection with you in this present time and space.Breathe and relax as Divine frequency and healing is broadcast alongside these very words. Breathe and relax as your team of angels and guides of the light and of the Divine begin to lift you up in vibration, to lift you up in frequency, lifting, ascending, rising into direct experience with the Divine. Entering into divine healing ground, a special place outside of time and filled with love and healing and vibrant well being. From within this space now, begin to focus your awareness within. Relax deeply, as your energy is awakened, ignited, and blessed with the hands of the divine. Breathe and begin to imagine that you are being transported back in time now to your childhood. Tuning into the essence of your inner child, the vibrant light, the joyful, playful, radiant love, and perhaps the fear or sadness or feelings of being unloved. Tune into this divine inner child now. Breathe and just be aware of what you find therein. Be aware of what your inner child wishes you to know now. Be aware, and strands of light from the Divine pour into this space and time, bringing blessings of healing and well being and rejuvenation to your soul of your inner child. Bringing blessings to the essence of this divine child of God, light, love, bliss, compassion, and understanding. Breathe in this light that is all around you. The cosmic ray of healing love containing every color of the spectrum, colors that you can see with your visible eye and colors that you can only comprehend with your psychic and intuitive vision. This healing light broadcast now is customized to bring whatever nurturing, enchantment, and magic, that is needed to refresh, to revitalize, and to reawaken the divine imagination of your inner child and the sense of well being, of knowing that you are provided for by the universe, and that all is well. Breathe in the light, and from the core of your being, notice fear, feelings of abandonment, feelings of rejection, feelings of being unloved tied to past experience, tied to overall experience, are pushed out from within, are elevated to the surface, are brought into the light of awareness, and released now into the Divine Light. And the feeling of knowing that you are infinitely loved, of knowing that you are safe, the feeling of well being, of excitement, and of radiant joy, this high vibration of the true essence of your divine inner child downloads into your being now. The divine blueprint for your healed inner child downloads into your being now, a clear, vibrant light being who has always existed in direct proximity with the Divine, connected fully and completely to divine joy, love, and well being enters into the special healing place, enters into this present time and space, downloads now into your very being, integrating these qualities of playfulness, of self love, of nurturing so that you are able to draw upon them in this present manifestation of yourself. For at this time, we heal your present self by healing your past self, for all are connected and so the wounds of the past are ready to release. Let them go. The words you hear now speak to your mind, but the frequency amidst the words speaks to your heart and your soul. Whatever wounds or pain or struggles you experienced as a child are being healed now. Be willing to let go of holding on to that pain. Be willing to replace that pain with the knowing that you are infinitely loved and, indeed, the challenges of childhood, the challenges of life seek not to hold you down, seek not to break your spirit, seek to provide you the contrast needed so that you are able to fully experience the light of the divine, spiritual, benevolent and beautiful being that you fully and truly are. And to understand this full light, for you understand the opposite. You understand the struggle. And so now you can experience the blessing. Love is all around you. Well being is all around you. Divine healing light is all around you. Breathe it in. And this light cycles through your body, refreshing each and every cell, pushing out at cellular level beliefs, emotions, and toxic energy held within your being. Release this now. Your energy may tense up for a moment before you release. Let it neutralize and go into the light so that you are able to integrate the full, divine qualities of your higher self. The divine qualities of your inner child, bringing back your playful nature, your trust in the universe, your complete and total love, your divine imagination and well being, self love, and love for all. Know, beloved one, that you are at the brink of entering into a new layer of experience for yourself. This healing from your inner child, brings the playful qualities, willingness, and imagination to your present self, to draw upon, to put yourself out there, to take a chance, to really go for it, to manifest the dreams, the desires, and the intentions of your heart into life. The time is now and you are ready. Open your heart and now let all this light of the Divine, the vibrant qualities of well being, of your inner child, the full magnificence of your higher self, and all the colors of the rainbow and more, of the divine cosmic healing light, ground now into your body, and flowing down, anchoring to the core of the earth, and connecting with an incredible light therein. Feel your oneness with this light you find at the core, feel your oneness with All That Is. And now this light begins to flow up, opening your earth chakra below your feet, opening your base chakra, your sacral, your solar plexus, your heart, your throat, your third eye, your crown, your soul star, and continuing up into the light now shine radiantly, brightly, benevolently, and beautifully, for you are a seed of the divine present in physical form and an aspect of you, a part of you, is always in direct experience with divine love, is always divine love. May all aspects of you, past, present, future, and parallel, reunite with your being in this time. May your power, may your gifts, and may your abilities return to you. May all energy that has been drained consciously or unconsciously now return to you cleansed and purified. Open your heart to accept these gifts and blessings. Open your heart and now let your love and gratitude and beauty flow out beyond, rippling out love, joy, and happiness beyond your own life, bringing the blessings of healing, of well being, and of love to the entire realm, to all souls in all universes at all times, now receive a healing of divine love, of grace, of beauty, and of light, for the highest and greatest good of all. And so it is. Now return your focus to your physical body, focusing within, and bring this uplifted frequency from the Divine with you into this new cycle, into this new beginning. Plant seeds of intention about what you truly desire to create. Open your heart, be honest, love yourself, and go for it. You are supported and now is the time. I am Archangel Haniel and I will assist you when I am called upon, for you are so dearly loved. Indeed, you are loved. Shine this, share this, be this, and live this, and love will align you with the blessings life has for you that are yet in store. Love, live, and enjoy. I am complete. And so it is. And so it is. Just amazing, beautiful and so loving! I love your voice, you are truly a blessing to humanity. Thank you for your Love and Light that shines so brightly! A multiple of Blessings to You!! Thank you! That was exactly what my soul needed to hear! I am just so longing to feel happy again and to be positive and to love my hubby and be financially free. If only I could hear and feel and see divine angel song and help for me, but the harder I try the less I get! I am not sure if I am spiritually alive any more. Is there hope for me? Of course there’s hope for you! Bring your mind and energy into the present moment… Set up a morning ritual with meditation, exercise, and reading. Trust that you are supported, but are also being called to be an active participant in creating positive change in your life. The morning ritual will help you know what to do next and bring yourself into the state where you can and will make it happen. Thank you. That was amazing .. I got so lost I felt I left my body. Wow going to continue to receive this gift you bring .. Thank you again. Thanks for such a beautiful meditation from Archangel Haniel.